Decorative wall registers are easily installed with the hardware that is included with your purchase. Aluminum air vents feature an operational damper that is easily adjusted for air flow control. These wall registers have a classic design that is timeless. Aluminum air vents are finished with a durable powder coat that is meant to last. Your new wall register will really make a design statement in your home or office. Aluminum air vents are shipped directly to you. Note: Decorative wall registers ship directly from the manufacturer and may up to 10 to 12 weeks to ship. 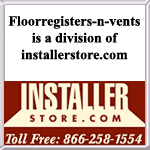 Tip: To make sure you order the correct sized aluminum air vent you should measure the actual hole size. For instance, a hole size measuring 4" x 12" would need a 4 x 12 register. Outside dimensions are approximately 1 1/2 inches larger, please call for exact dimensions. Want a decorative wall vent, but with a different finish or style? Take a look at our many options for you to choose from. We also offer matching floor registers to coordinate the look. Replace your plain registers with these beautiful aluminum air vents, they will bring a touch of style to any room.